Enchanted Unicorn is a former land-based casino favourite slot game that has been given the online conversion treatment by online casino slot developer International Game Technology (IGT). 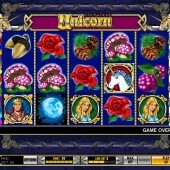 The game is a 5 reel, 20 payline slot that has a theme based on the magical and mystical legend that is the unicorn. The slot has a vintage feel to it and IGT has done a great job transforming the slot to the online genre whilst maintaining its land-based authenticity. Symbols in the game include a Lion, Prince, Damsel, Rose, Mushroom, Mulberry, Pine Cone and Acorn. It might not be a theme that will appeal to the men as much as the women but if you can put the masculine cape down for a second then you will find a game that offers more than just a fairytale theme. The game has a traditional format with just the one main bonus feature in the form of the Unicorn Treasure Chest Bonus feature. It is triggered when you hit the Treasure Chest scatter symbol simultaneously on reels 1 and 5. When the bonus feature begins, you will have to find your way through a treasure-filled grid. If you find the Mystical Unicorn on this grid then you will win all of the treasures on the row you found the Mystical Unicorn on. You must also avoid the Evil Wizard who will be out to end your bonus feature experience as soon as possible. If you do manage to avoid the Evil Wizard then you will make it to the Treasure Chest that will open to reveal a huge win. There is a second scatter symbol in the form of the Blue Moon. This scatter symbol can complete winning combinations provided three or more of the Blue Moon symbols appear across the reels to offer a scatter pay out. Enchanted Unicorn also has Wild Multiplier symbols that are represented by the Enchanted Unicorn symbol. These symbols will substitute for all other symbols except for the scatter symbols to complete winning combinations. In addition to completing winning combinations, the Wild Multiplier symbols will also multiply the payout for these winning combinations. 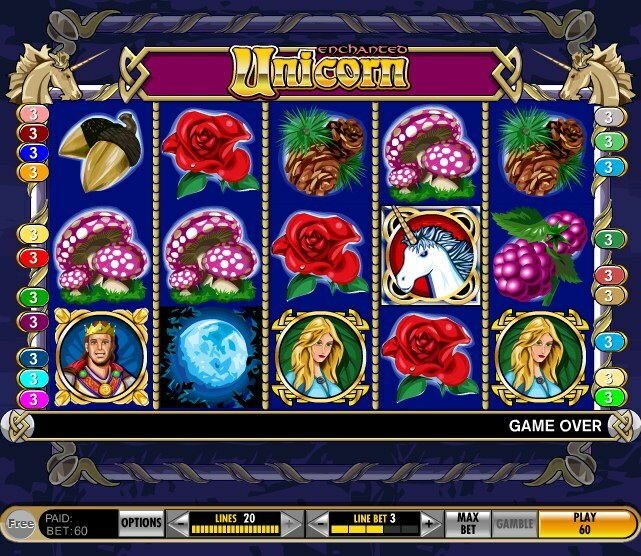 Enchanted Unicorn is vintage slot gaming at its finest. There are no over-the-top bonus features or complex Wild symbol rules. This is stripped back slot gaming to the core which will be adored by the purists. Players that have enjoyed the cat-themed Kitty Glitter by IGT and online casino developer WMS Gaming’s Irish slot Leprechaun’s Fortune will love this game from the very start. Don’t let the fairytale theme deceive you. This slot is golden.